Last week, the US Department of Agriculture released the findings of its latest 5-year Census of Agriculture (the 29th in the series, with data collected from the nation’s farms and ranches in 2017), providing an eagerly anticipated update to the nation’s most comprehensive agricultural dataset. Ahead of the release, I posted my top 4 questions for the new Census. Now that it’s out, what have we learned? 1. Yes, farmers are (still) getting older. According to the new data, US farmers continue to get older. The average age of all farmers (or “producers” in the Census) went up from 56.3 to 57.5 years, and the average age of “primary producers” increased from 58.3 to 59.4 years. Furthermore, most farmers are still overwhelmingly white (95.4 percent) and male (64 percent). However, the number of female farmers reported increased by 27 percent since 2012, whereas the number of male farmers reported declined by 2 percent. Note that this result reflects the effectiveness of the USDA’s changes to demographic questions, which allowed farms to list more than one producer engaged in farm decision-making. 2. Yes, farm consolidation continues to increase. New data on farm economics show continued declines for both farm numbers (3 percent) and acres (2 percent), due to losses among mid-sized farms. Meanwhile, average farm size has increased by 2 percent. And the largest farms (with $1 million or more in sales) represented just 4 percent of total farms but accounted for a disproportionately high amount (69 percent) of total sales. Similarly, only five commodities (cattle and calves, corn, poultry and eggs, soybeans, and milk) represented 66 percent of all sales. The latest findings also suggest that staying profitable is getting tougher on US farms. While expenses decreased slightly (mostly from lower feed costs), increased labor costs and declining value of agricultural production dented profits. Ultimately, farm incomes decreased, averaging $43,053, and only 44 percent of farms had a positive net cash farm income. Farmers also relied more heavily on government payments, which were 11 percent greater than in 2012. Likely related to these challenges, 58 percent of farmers reported that they have a primary occupation other than farming. 3. There is some evidence that healthy soil farming practices are catching on. The most exciting news in this category is that cover crop use increased. The area planted in cover crops expanded from 10 million acres in 2012 to 15 million acres in 2017. The census also started collecting data on cover crop seed purchases, creating a benchmark for future years (115,954 farms purchased cover crop seed worth $257 million). Other conservation practices that increased included no-till farming (from 96 to 104 million acres) and conservation tillage (from 77 to 98 million acres). Though the gains are relatively small, they track the excitement we’re hearing anecdotally from farmers. Interestingly, 30,853 farms reported using agroforestry practices, including alley cropping, silvopasture, forest farming, and riparian forest buffers or windbreaks, providing another useful benchmark for future years. This number is notably higher than data from 2012 in a similar, but much narrower, category, which found that only 2,725 farms reported using alley cropping or silvopasture. 4. New questions in the 2017 census offer new insights. Thanks to new categories of data collection, we now know that 11 percent of farmers have a military background (i.e., currently or previously served on active duty in the US Armed Forces), and 17 percent of all farms include a farmer who has served in the military. We also now know more about farm decision-making than previous results were able to track. For example, female farmers are most involved with day-to-day decisions, record keeping, and financial management. Young farmers are more likely than older farmers to make decisions related to livestock. My first glance at the data was enough to offer initial answers to my top questions, but only scratched the surface. After all, even the summary document is 820 pages long, the numbers themselves present the opportunity to explore an endless number of questions, and—as I mentioned last week—there’s a lot more data on the way! In the meantime, a few takeaways do emerge. First, there are plenty of areas where the answers provided to my questions raise, well… more questions. For example, given that the farming population continues to grow older, and that consolidation continues, what solutions can we develop? Addressing these questions will likely require even more investment in USDA’s budget for research and economic analysis—not less. But to end on a positive note, the new census provides yet another piece of evidence for a different growing trend: farmers are increasingly adopting and recognizing the benefits of farming practices that build soil health. Now that’s good news. With the countdown to the 2022 Census of Agriculture beginning, let’s dream big about what we can do now to see an even more positive story in the 30th edition. Models are representations of complex phenomena that are used to approximate outcomes. While they have limitations, they are an important tool to help scientists and decisionmakers understand potential futures based on scientific, technological and policy changes. With both potential and profound risks and uncertainties, we need more expansive modeling research on solar geoengineering techniques – not only to understand possible environmental impacts and risks, but political and social consequences as well. Without looking at this broader range of outcomes, the messaging behind solar geoengineering can then lead to simplifications and mischaracterizations of its potential in the media. In spaces where public familiarity is low and risks are high, scientists and journalists should both be responsible for capturing the nuance and complexities around geoengineering – only a full picture will enable an informed public debate. In the case of solar geoengineering, models offer the opportunity to examine questions on a global scale – a scale at which real world experiments aren’t yet feasible or ethical. A small set of researchers have been examining the potential outcomes of solar geoengineering through modeling impacts for several years. This research has been valuable in gaining a deeper understanding of the possible consequences of deploying solar geoengineering. However, many of the scenarios analyzed have been under idealized, or “best case” conditions – in other words, we’re not comprehensively looking at what could go wrong. And as we all know too well, the real world rarely imitates the best-case scenario. An example that comes to mind is that of DDT. Developed as an insecticide, DDT was extremely effective at reducing mosquito populations for a number of years during and after World War II. However, widespread use of the chemical led to massive environmental harm due to a failure to thoroughly investigate its impacts before widespread use – impacts that were not accounted for. With more attention being paid to solar geoengineering, researchers need to explore a more meaningful range of deployment scenarios to understand risks and tradeoffs under a much broader set of conditions. Modeling is most helpful when used not just to predict a particular outcome under the best-case conditions, but rather to learn about many possible futures. With climate change, researchers have studied technical, economic and political narratives to capture a more realistic set of outcomes, and a similar strategy needs to happen for geoengineering. Only when research is done to know what can go wrong – in addition to what can go right – can we have a clearer idea of what the use of solar geoengineering could potentially entail. In other high-risk fields, we require a high level of investigation about what could go wrong. Military war gaming exercises are a prime example: simulations of best- and worst-case scenarios are conducted by the government to see how politics, military strategy, and potential outcomes could interact in a myriad of ways – all before real combat takes place. Just as its the responsibility of a carpenter to “measure twice and cut once,” generals and admirals investigate war scenarios in order to save lives and minimize collateral damage. Solar geoengineering merits the same level of analysis. Despite the risks of oversimplification, a new optimistic study titled, “Halving warming with idealized solar geoengineering moderates key climate hazards” was recently published in Nature Climate Change. Written by scientists at Harvard, Princeton, MIT, and the Georgia Institute of Technology, these researchers modeled a simplified proxy of solar geoengineering to counter half of future climate change (estimated as a doubling of carbon dioxide). They found that under these specific conditions there could potentially be a decrease in some climate impacts (such as temperature, water availability, and tropical storm intensity) across regions. However, in addition to other limitations, the study used an idealized solar geoengineering system in the model – in other words, simply turning down the sun without the use of a particular approach, like aerosols. This can be helpful to understand aspects of solar geoengineering, but without a technology in place, it’s not realistic to make assertions about who might be worse off since use of that technology would come with its own set of risks. In an era characterized by 280-character tweets, headlines matter. These oversimplifications from reputable news organizations do a disservice to geoengineering discussions. If readers moved past the headlines, they’d find that while journalists and authors often qualified the findings, there were extremely mixed messages about the real meaning of these results. Just as importantly, we need studies that would characterize a more realistic range of scenarios. As a newly emerging topic for public debate, it is crucial that solar geoengineering is presented in an accurate way. False impressions will only harm us when society needs to make critical decisions on how to approach it. But is Secretary Perdue’s statement also a response to the dawning reality that many of the people and communities who would be affected by the rule change are the same who helped elect President Trump to office? If it’s not—maybe it should be. I’ve written previously about how the administration’s proposed changes to SNAP would make it harder for unemployed and underemployed adults to put food on the table—and why that’s bad policy for all of us. According to new UCS analysis, the proposed rule would cause 77 percent of all US counties currently using waivers to lose them—that’s a total of 664 counties from coast to coast. And my colleagues and I have crunched the numbers to show who would be hurt most. Layering data from 2016 election results, we found that more than three-quarters of counties that would lose waivers went to then-candidate Trump in the presidential election. In total, that’s more than 500 counties (and over half of them rural) that put their faith in a president who promised to bring prosperity to every corner of the country, and isn’t delivering. While the administration has boasted of low unemployment rates and high job creation during its tenure, these national figures belie the persistent need that still plagues an overwhelming number of communities. Since the 2008 recession, labor force participation has dropped, wages have remained stagnant, and hunger remains widespread: food insecurity rates in 2017 were still higher than pre-recession levels. Relying on unemployment data alone to determine whether states can receive waivers—particularly at the threshold specific in the rule—ignores critical considerations about what’s actually happening in communities, and why states are best suited to assess their populations’ needs. Below are snapshots of three counties from around the country that would lose waivers under the proposed SNAP rule. Although each is unique, they are all difficult places to find stable employment—and they all voted for President Trump in 2016. Murray County, Georgia, a mostly rural area located on the state’s northwest border, had a population of 39,358 in 2016. For this mostly white county (83.7 percent in 2016), the 24-month unemployment rate between 2016 and 2017 was 6.8 percent, a rate nearly three percentage points higher than the national rate and a poverty rate of 18.8 percent, which is 34 percent higher than the US poverty rate. Manufacturing employed the largest share of workers in the county (38.5 percent), and recent reports indicate that Murray County’s unemployment has ticked up slightly, even though Georgia’s urban areas are seeing job growth. Trumbull County, Ohio, is on the eastern border of the state, with a population of roughly 200,000 and a 24-month average unemployment rate of 6.8 percent from 2016 to 2017 and a poverty rate of 17.5 percent. Just over one in five workers here are employed in manufacturing. In fall 2018, GM announced that it would close its Lordstown assembly plant in Warren, OH. Butte County, California, is a mostly urban county with roughly 220,000 residents in 2016. The county is home to a diverse set of organizations and businesses, including California State University Chico, United Healthcare, and Pacific Coast Producers (a cooperatively owned cannery, owned by over 160 family-farms in Central and Northern California), to name a few. Butte is also home to Paradise, a town severely impacted by the Camp fire that occurred in 2018. The average unemployment rate in Butte County was 6.5 percent for the most recent 24-month period and 3 percent of the population lived in poverty in 2017. Although the comment period for the proposed SNAP rule closed on April 10, Secretary Perdue’s comments—and continued debate among lawmakers—suggest that the issue may not yet be settled. For hundreds of thousands of adults and the communities they live in, that’s a good sign. If you, like me, find yourself at times swinging between a sense of the challenge of climate change on the one hand, and the excitement of clean energy on the other, you might appreciate the need for balance and perspective. The progression of our effects on the global climate are captured powerfully (and frighteningly) in a viral graphic from UK climate scientist Ed Hawkins that shows variations in global temperatures since 1850. While it varies by month and year, the trend shown in the GIF is really (really) clear: The passing years have brought higher and higher temperatures. Serious, sobering stuff, given all that comes with that global warming. So it seems like we need things to counterbalance graphics like that, at least in part—not to take the pressure off, but to remind ourselves of where we’re making important progress, and laying the groundwork for a whole lot more. One option is to take a look at what’s going on with clean energy in the power sector—and wind and solar, in particular, which have been marvels to behold in recent years. The graphic, from the Union of Concerned Scientists, draws on electric power sector data from the US Department of Energy’s Energy Information Administration (EIA), and includes wind power, large-scale solar, and (importantly, given that it too often gets ignored) the increasingly significant contribution from small-scale/rooftop solar. And this little GIF has a lot to say. It begins with wind and solar’s humble status early last decade, when wind barely registered, and solar wasn’t a factor at all. From there the spiral sure picks up steam, as each year has brought online more wind turbines (now 58,000 and climbing) and more solar panels (on nearly 2 million American rooftops, and far beyond). On a monthly basis, the contribution of wind and solar has shot past 3% (2010), past 6% (early 2013), past 12% (April 2018)—where every additional 1% is the equivalent of more than 4 million typical US households’ electricity consumption. And on an annual basis, that progress has translated into the electricity contribution from just those two technologies going from 1 in every 71 kilowatt-hours in 2008 to 1 in every 11 in 2018. And the graphic clearly conveys the momentum poised to carry solar and wind far beyond. There’s a lot more progress coming, it declares—clean energy milestones to be watching out for (and making happen). To be clear, the new graphic and all that it represents shouldn’t cause us to lose sight of what really matters: from a climate perspective, what’s happening to overall carbon emissions, and the resulting temperature changes. It’ll take a lot more clean energy—a lot less fossil energy—in our electricity mix to help us deal with climate change. But the progress on clean energy is really important because of the power sector’s still-substantial contributions to our carbon pollution, and the need for a lot more action. And that progress also matters because the power sector is crucial for cutting carbon pollution from other sectors, through electrification of stuff like transportation (think electric vehicles) and home heating (heat pumps!). That’s why keeping our eyes on stats like these is key: We need to celebrate the progress we’re making, even as we push for so much more. Sartorial solar splendor on its way? Meanwhile, it turns out that the Hawkins graphic in stripe form has gone on to become the basis for a line of must-have clothing and more. We can hope that the good news about the progress of US solar and wind becomes just as desirable a fashion accessory. Las noticias sobre el calentamiento global pueden ser alarmantes, y algunas presentaciones visuales son particularmente efectivas para transmitir las malas noticias. A pesar de lo serio que es el cambio climático, sin embargo, es importante recordar que tenemos respuestas serias. Un nuevo gráfico sobre el progreso de la energía eólica y solar en los Estados Unidos ayuda a evidenciarlas claramente. Si tú, como yo, te encuentras a veces alternando entre un sentido realista del desafío que representa el cambio climático por un lado, y la emoción del progreso de la energía limpia por el otro, talvez puedes apreciar la necesidad de equilibrio y perspectiva. La evolución de nuestro impacto en el clima global fue capturada poderosamente (y aterradoramente) en un gráfico viral del científico climático británico Ed Hawkins. El gráfico muestra las variaciones en las temperaturas a nivel global desde 1850. Mientras varía por mes y año, la tendencia mostrada en el GIF es sumamente clara: El paso de los años ha traído temperaturas más y más elevadas. Algo muy serio, dado todo lo que viene con ese calentamiento global. Dado eso, parece que necesitamos herramientas para contrarrestar esta clase de gráficos, por lo menos en parte. No para eliminar la presión que sentimos de actuar, sino para acordarnos de las áreas en que estamos logrando un progreso importante, y creando una base sólida para mucho más. Una opción es observar lo que está pasando con la energía limpia, especialmente con las energías eólica (del viento) y solar, que han estado progresando de forma impresionante en los últimos años. El gráfico, elaborado por la Union of Concerned Scientists, representa datos del Departamento de Energía de los EE. UU. e incluye la energía eólica, la energía solar a gran escala y también la energía solar a pequeña escala (lo cual es importante dado que muchas veces es ignorada). Y ese pequeño GIF tiene mucho que decir. Empieza con el estado humilde en que se encontraban las energías eólica y solar al principio de la década pasada, cuando la energía eólica apenas si se podía reconocer en las cifras y el efecto de la energía solar no era distinguible. De allí la espiral se acelera, con la conexión cada año de más turbinas eólicas (ahora 58,000 y creciendo) y más paneles solares (en casi 2 millones de techos estadounidenses, y mucho más allá). Desde el punto de vista de las cifras mensuales, la contribución de las dos tecnologías llegó al 3% en 2010, al 6% en la primavera del 2013 y al 12% en abril de 2018, con cada 1% adicional equivalente al consumo eléctrico de más de 4 millones de hogares típicos estadounidenses. Y desde el punto de vista anual, ese progreso se ha traducido en que su contribución a la matriz de generación eléctrica pase de 1 de cada 71 electrones en 2008 a 1 de cada 11 en 2018. Y el gráfico transmite claramente el momento que está listo para llevar a la solar y la eólica mucho más allá. Hay mucho más progreso en ruta, declara, representado en hitos de energía limpia que esperamos (y que nos esperan a nosotros para llevarlos a cabo). Este nuevo gráfico y todo lo que representa no debe hacernos perder de vista lo que realmente nos importa del punto de vista del clima: lo que está pasando con las emisiones de dióxido de carbono (CO2), y el calentamiento global. Vamos a necesitar mucha más energía limpia y mucha menos energía fósil en nuestra matriz eléctrica para ayudarnos a enfrentar el cambio climático. Pero el progreso que estamos logrando con la energía limpia es muy importante dada la contaminación por CO2 por la cual el sector eléctrico sigue siendo responsable, y la necesidad que tenemos de mucha más acción. Y ese progreso es aún más importante porque el sector eléctrico es crucial para lograr reducir las emisiones de CO2 también en otros sectores a través de la electrificación del transporte (los vehículos eléctricos), por ejemplo, y la calefacción (las bombas de calor). Es por eso que es clave seguir prestando atención a cifras como éstas: Tenemos que celebrar el progreso que estamos logrando, mientras empujamos a la vez para lograr mucho más. Mientras tanto, resulta que el gráfico Hawkins en forma de rayos se ha convertido también en la base de una variedad de ropa y otros accesorios “imprescindibles”. Esperemos entonces que las noticias sobre el progreso de las energías eólica y solar se conviertan también en un deseado accesorio de moda. As California’s electric utilities grapple with the aftermath of record-breaking wildfires, the potential impact on customer bills is starting to come into focus. While it is still unclear who will end up paying for wildfire damages, one thing is clear: extreme wildfires are here to stay, and they will likely keep getting worse. With climate change increasing not only the risk of wildfires, but also threatening many other economic and human health impacts, the costs of preventing extreme climate change pale in comparison to the costs of inaction. To cover the costs of only the 2017-2018 wildfires, one estimate indicates that residential utility bills for customers of the state’s largest utility, Pacific Gas and Electric (PG&E), would need to increase by $300 annually. However, another estimate indicates that, if wildfires in California continue to inflict as much damage as they have over the past two years, PG&E bills would need to double to cover the recurring costs, while bills for electricity customers across all of California would need to increase by 50%. Unfortunately, the last two years of wildfires have not just been an extraordinary fluke. Over the past few decades in the Western US, the number of large wildfires has been rising and the fire season has been getting longer. While there are multiple factors driving these changes, climate change is increasing the risk of wildfires. As climate change drives up temperatures and changes precipitation patterns, California can expect more frequent wildfires and more acres burned in the future. But the costs of climate change will not just show up in higher electricity bills. A recent report from scientists at the Environmental Protection Agency calculated the costs of climate change by the end of the century under different scenarios. While the report found that climate change will cost the US economy hundreds of billions of dollars annually, it also showed that a slow response to climate change, or worse, inaction, will cost us far more in dollars, property losses, public health and human lives. If we limit global warming to two degrees Celsius, tens of billions of dollars in damages could be avoided every year by the end of the century – which works out to savings of $250 to $600 per person per year. This just goes to show how costly it will be not to address climate change. The US economy can avoid billions of dollars in damages by reducing global warming emissions to stay on a lower-emissions trajectory. Figures are from the Fourth National Climate Assessment. This brings us back to PG&E, which is grappling with massive wildfire costs. If these costs end up being passed on to electricity customers, it could ultimately hinder California’s ability to prevent further climate change. If electricity prices go up significantly, people who own electric vehicles or have all-electric homes will face much higher costs. Since vehicle and building electrification are key components of California’s strategy to reduce global warming emissions, substantially higher electricity costs would disincentivize electrification and make emissions reductions more difficult to achieve. Climate change is increasing the risk of wildfires. Wildfire costs might increase the cost of electricity. Higher electricity prices would disincentivize electrification, which is one of California’s main tools for preventing climate change. Maintaining or, even worse, increasing, our global warming emissions trajectory will lead to more climate change impacts, such as extreme wildfires. In short, climate change may make it more difficult for California to prevent climate change. At the end of the day, this problem is not going to solve itself. We will need to make all sorts of investments to prevent further climate change and to adapt to the climate change we have already locked in. Encouragingly, the governor of California is taking climate change prevention and adaptation very seriously. The governor’s office recently released a report that details a wide array of policy options meant to address the climate change and wildfire problems faced by California’s electric utilities. While some of those policy changes will no doubt be necessary, California also needs to continue investing heavily in solutions that we know are necessary for the transition to a clean energy economy. Renewable energy, electric vehicles, energy efficiency, and many more solutions are critical to the state’s emissions reduction goals, and California needs to continue making these investments even in the face of expensive disasters exacerbated by climate change. These investments will not just be out of the goodness of our hearts. With hundreds of billions of dollars in climate-change-caused damages on the line, putting money into climate change prevention is a wise investment. As the northern hemisphere steadily moves beyond the spring equinox, its time for a look back on the US winter season. With the arrival of spring, days stretch longer and bud bursts dazzle passersby, and we almost forget what the winter brought us in terms of extreme weather and that, as counter-intuitive as it may seem at times, winter is still very much a part of a warming world. And it is characterized by the changing behavior of the most unwelcome parts of any season: extreme weather. Here we’ll review five notable patterns from this past cold season. The National Weather Service defines the winter season for the US as December through February and the cold season as November through March. The 2018–2019 winter season storm period kicked off with an exceptionally early Thanksgiving blizzard, and even now the storms aren’t quite over as Winter Storm Wesley is likely to break many April snow records. Like other storms that are given names as they make headlines, Wesley is a rare bomb cyclone, a mid-latitude storm that undergoes a sudden and extreme drop in barometric pressure over 24 hours that leads to rapid intensification. (Note that the exact pressure drop over 24 hours that qualifies is based on the latitude.) As of this writing, Wesley was expected to bring blizzard conditions from Denver to the Minneapolis area, as well as hail to Kansas and eastern Nebraska. It is rare to have a bomb cyclone within the continental United States, yet two have occurred this season. Along with Wesley, Winter Storm Ulmer (March 12-14) brought blizzard conditions, high winds, sudden melt of ground cover snow and subsequent devastating flooding that destroyed levees. Unfortunately, record-breaking bomb cyclone Ulmer made the US list of billion-dollar weather and climate disasters. During Ulmer, Denver set an all-time low pressure record (MSLP) and the strongest non-thunderstorm gust on record (80mph); gusts of 96 mph hit Colorado Springs; high winds derailed a train in New Mexico; and multiple stations logged gusts of more than 100 mph (San Augustin Pass, NM; Cloudcroft, NM; Pine Springs, TX). Repeated Arctic outbreaks of cold air into the Lower 48 were another feature of this cold season. These are tied to a weakening of the stratospheric polar vortex. 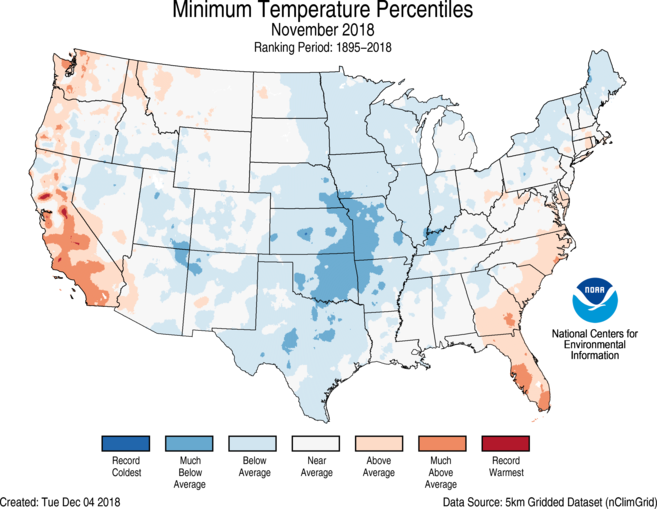 Marking an early start to the cold season, Kansas City, Missouri, logged the coldest November temperature on record, with much of the Lower 48 registering below average or much below average minimum November temperatures. Illinois set an all-time record low of -38 degrees Fahrenheit on January 31, 2019. Imagine what these cold temperature records (as registered on an official thermometer) actually felt like if you were outside and exposed to blowing winds, with increased chances for hypothermia under severe windchill. One Arctic outbreak included a winter storm that brought snow from the northern plains to the Great Lakes and the Northeast; the coldest temperatures in years to the Midwest; and closed schools, cancelled flights, and, tragically, brought an associated weather-related death toll. Figure 1. Examples of cold outbreaks (Jan 29 and April 11 of 2019). Image source: ClimateReanalyzer.org. Many winter sports enthusiasts enjoy their favorite activities after a fresh snowfall and this cold season brought abundant snow November through February. he repeated Arctic cold outbreaks helped because when precipitation occurred, it often fell in the form of snow versus rain, which has been a problem cropping up more frequently in recent seasons. The ski industry welcomed a much needed boost in visitors and winter gear sales. This winter season also featured an emerging El Niño, a phase of a natural Pacific Ocean cycle that can bring wet conditions to the southern US region during winter. When storm tracks bring moisture from lower latitude ocean regions (such as the Pacific or the Gulf of Mexico) these can dump intense precipitation over the US. Such events were also a feature of this season and brought devastating floodng to many communities in the US. Unfortunately, this is another pattern emerging over recent years in a warming world and one that was on full display in Louisiana, where the Bonnet Carré Spillway had to be opened for only the thirteenth time since its construction to protect the city of New Orleans from floodwaters of the Mississippi River. We notice (and I have seen it opened myself during a random winter visit to the city) that it has been opened more frequently in recent years, and that this season marks the first time that the spillway was opened in consecutive years for the first time in its 88-year history. To top off this look back toward the cold season, we find that Alaska was unseasonably warm. The records were for record warmth compared to historical cold season trends and were such that traditional dog sled races had to be cancelled. Perhaps no surprise as recent years we have read headlines that remark on the truckloads of snow being brought to Anchorage to allow the start of the Iditarod, Alaska’s most famous dog sled race. It all adds up to record-breaking extreme weather for the US during this past winter season. As the Intergovernmental Season on Climate Change special report on extreme weather has noted, one of the signatures of climate change is more extreme weather events. Winter 2018-2019 in the US was no exception.